Map of the 79 mile (127km) Dales Way through the Yorkshire Dales between Ilkley and Bowness-on-Windermere. This booklet is included with the Cicerone guidebook and shows the full route on OS 1:25,000 maps. 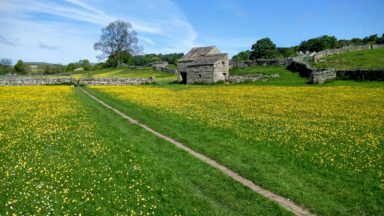 One of the most gentle multi-day walks in Britain, it passes through Grassington, Kettlewell, Dent, Sedbergh and Staveley. 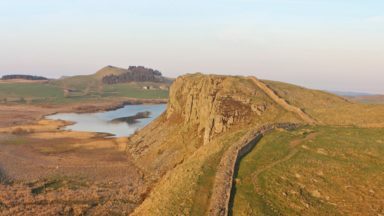 The walk is scenically at its best in Spring and Autumn (April-June and September-October), but is an all-year round walk for suitably equipped walkers. This is an ideal route for anyone wanted to attempt multi-day walking for the first time. There are no significant physical difficulties beyond the basic need to walk a certain distance each day. Historic buildings, roads, bridges, etc. Landscape, flowers and wildlife. Bolton Abbey, Dent, Dales villages. The scenery is outstanding throughout, and a string of communities line the route but without detracting from the sense of freedom. All the mapping you need to complete the Dales Way, a 79-mile long-distance route through the Yorkshire Dales, from Ilkley to Bowness-on-Windermere. NOTE: An accompanying Cicerone guidebook – The Dales Way - describes the full route with lots of other practical and historical information. The accompanying guidebook includes a copy of this map booklet. This booklet of Ordnance Survey 1:25,000 Explorer maps has been designed for convenient use on the trail. It shows the full and up-to-date line of the Dales Way, along with the relevant extract from the OS Explorer map legend. It is conveniently sized for slipping into a jacket pocket or top of a rucksack and comes in a clear PVC sleeve. The Dales Way links two of England's most celebrated national parks, the Yorkshire Dales and the Lake District. 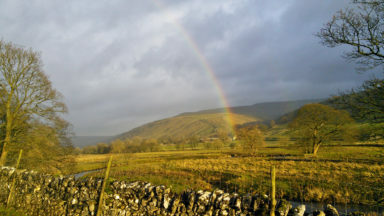 The waymarked route showcases the region's beautiful limestone landscapes and historic towns and villages as it passes through Wharfedale, Dentdale, Lonsdale and the Lakeland fringe, accompanying rivers great and small, crossing farmland – and just a little moorland, and following wandering winding lanes. 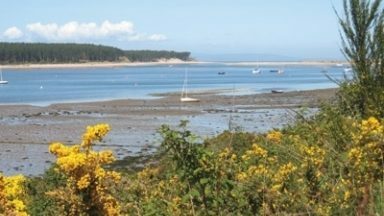 Well served for accommodation and facilities, and with easy walking on riverside paths, it is one of the gentlest multi-day walks in Britain and therefore an ideal introduction to long-distance walking. An excellent step by step guide to the route which includes some stunning pictures and is extremely easy to follow. Looking for something to do for a week this summer? Well, here is a thought for you. 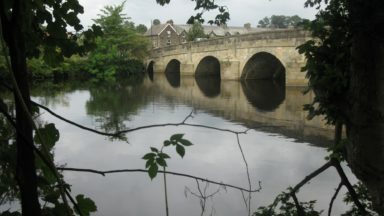 What about walking from Ilkley to the Lake District via the Dales Way? At a distance of 78 miles, it is an ideal walk for completing in 6, 7 or 8 days (13, 11 or 10 miles per day respectively). The ascents are mostly gentle with an average of about 1,000 feet per day. It is over 40 years since I first walked this particular long-distance route when I was Scout Leader in Horsforth taking the Scouts on this walk during a week at Spring Bank Holiday but having read Terry Marsh’s updated guide it is about time to renew acquaintance with this superb trail. Terry’s first guide to the Dales Way came out 26 years ago and there have been quite a number of improvements to the route since then necessitating periodic revisions. Both the starting point in Ilkley and the finish at Bowness are well served by public transport with train stations at each location. Windermere Station is a mile from the finish point but for anyone who has already walked 78 miles, a further mile is not an issue, particularly if you have had a good meal at The Trattoria, the best Italian Restaurant in Bowness, to celebrate the completion of the walk. As well as an excellent step by step guide to the route, Terry has also included a breakdown into the stopping points for a 6, 7 or 8-day completion. There is also an appendix of accommodation on route, plus details of facilities, where to obtain cash at overnight stays, equipment to take and wear, weather and waymarking. Accompanying the book there is a 1:25,000 route map booklet which includes the area up to a mile or so adjacent to the walk as well as the clearly defined route itself. For anyone wishing to walk the route in reverse i.e. 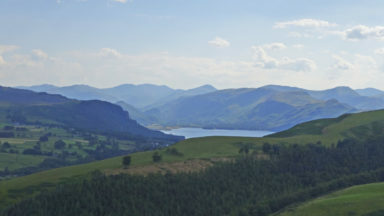 West to East, starting at Windermere and finishing at Ilkley, Terry has included a reverse route description at the end of each stage in the book. This is an excellently produced guide which includes some stunning pictures and is extremely easy to follow. I can conclude no better than quoting from the first page of Stage 1. “This first stretch into Wharfedale presents no real challenges other than coping with a surfeit of beautiful landscapes and joyful walking”. What more can I say? A very good guide which I can recommend to all those undertaking this fantastic walk. Just completed the last section of the Dales Way from Dent Head to Windermere (did the first half last year). Used the new Cicerone guide which we found to be excellent. It is accurate, precise and clearly written. All the route instructions were unambiguous and left no room for doubt. The route passes through areas with numerous paths, many of which are more obvious on the ground than the Dales Way route so this level of clarity is vital to avoid any errors and delays. The background information was relevant and clearly presented to avoid interference with route descriptions. We had booked our travel and accommodation before the book was published so did not use that element of the book. All round a very good guide which I can recommend to all those undertaking this fantastic walk.